For all of your pool and spa remote needs, Spectrum is a San Fernando based company with competent repair techs and many years of experience in automated controls. For operating your fountain, lights, spa, and heating systems, give our staff a phone call to discuss your current needs. Upgrading your system for ease of operation means that you can turn your spa light on and off, warm your water, and turn on the jets without having to go to the equipment pad. This convenience is enough for many to install a Jandy or Pentair system, and Spectrum has the experience to accomplish it with ease. 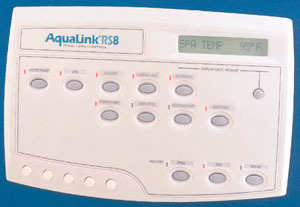 A hand held, easy to operate, remote control is now becoming standard for many new pool owners. There are a few brands to choose from and we can advise on the special features of each. Also some compatibility considerations require that we schedule an on-site evaluation to determine the best system for you. Whether you have a Jandy Aqualink, Compool, Hayward, Polaris, or Pentair Intellitouch automation system, the Spectrum team of professionals are capable to handle most diagnostic issues and provide a pinpointed repair solution. We are also adept at conversions and new installation. Current systems are getting even better with easier to navigate touch screens for indoor or outdoor operation, and handheld units that do not frustrate the average homeowner. For technical advice or information about installing a remote control for your water feature, pool or spa, give us a call. The Pentair Intellitouch has an ability to be programmed from any remote computer, and so can allow the owner to turn the spa on, the lights, jets and heat from the office before coming home. This convenience and the simple operation without having to enter the equipment pad is one reason why people upgrade. The Jandy Aqualink system is popular as it is one of the first companies to develop and push their product within the service industry. As well, it has many options and features that make for ease of operation. Their Aquapure model integrates a saline module for conversion to salt, and is less expensive to install this way. In the West Valley with pool and spa combinations and sometimes fierce weather, it's nice to be able to operate your pool heater and turn on your lighting from inside the house, or even spa-side. Spectrum awaits your call to perform whatever service need you may have at this time. In the Conejo Valley, Spectrum is performing installation and repairs for all your swimming pool equipment needs, and has been doing this for over 23 years now. Remote operation of the spa and related system for all your water feature needs is now easier with the latest generation of controllers. Whether your current system is a Jandy Aqualink, Hayward, Pentair or Compool, these automation panels and valves are comparatively reliable as years of development has produces effeciently designed controllers with greater adaptability. We can install an automation component to your existing circulation system today. For multi-body valve operation when operating a combination of water features, you may need a simplified one-touch system enabling light, heating, circulation, and jets to be turned on at will without having to visit the pool equipment station Check in with Spectrum for details regarding installation and repairs.